Newbury, N.H. (Oct. 2, 2018) – With only a fraction of the opening round complete at the Robert H. Elliott Mid-Amateur Championship, top names sit among those leading the way so far. Nick MacDonald, a member at host course Baker Hill Golf Club, currently sits at 1 under through 11 holes and has a one-stroke lead over the rest of the field. MacDonald, who has played Baker Hill a time or two, was able to card two birdies and just one bogey in the 11 holes he got in on Tuesday. He will look to continue that strong play when the competition resumes. MacDonald is no stranger to leading this tournament as he won the New Hampshire Mid-Amateur Championship in 2016 when it was held just down the road at Lake Sunapee Country Club. There are five players behind him at even par who have seen their names at the top of leaderboards before, including Jamie Ferullo, who recently won the Players Invitational which is held each year at Baker Hill. Ferullo, who has played 10 holes in his first round, made the turn at 1-under par but bogeyed his 10th to sit at even par. Joining him at even par are Rick Moreau, Michael Mahan, Travis Landry and Pat Pelletier. Wind, rain and cold temperatures called for difficult playing conditions up at Baker Hill, but many players were able to navigate their way to low scores. On the other hand, some praised the decision to postpone the remainder of the opening round to Wednesday based on how tough the conditions were. The first round will resume Wednesday morning at 9:30 a.m. As players complete their first round, they will get back onto the course to begin their second round of the championship. Following completion of Round 2, a cut will be made to the low 27 players and ties to move on to the third and final round of the tournament, which will take place on Thursday. The tournament will consist of 54 holes stroke play with a cut for Saturday to low 27 players and ties. 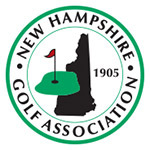 Entries are open to male members in good standing of member NHGA Clubs who are legal residents of New Hampshire. Applicants must be 30 years of age by the first day of the tournament.